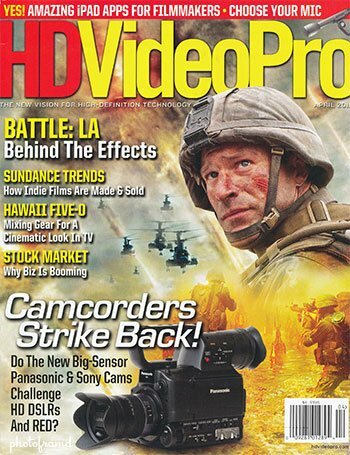 If you have an interest in shooting HD-Video with a DSLR like the Canon 7D, you should take a look at the new issue of HDVideoPro. It is one of the few magazine devoted to shooting professional HD-Video. The April 2011 issue in particular is filled with info about the Canon 7D. For instance, did you know that the Canon 7D was used in both the motion picture Battle: LA as well as the TV-series Hawaii Five-O?? This magazine has articles which focus exclusively on shooting/editing HD-Video and includes gadgets (and ads) for products which I have never seen in any of other digital photography magazine. If you are shopping for a camera stabilizer system, LED lights, external microphone or HDMI monitor, you need to pick-up this magazine. Even Adorama has several pages of ads since they have become a major seller of professional video equipment. It’s really a great issue! I have a 7D & the auto focus leaves much to be desired! Manual focus for those of us with aging eyes isn’t always an option. The video is idiot proof compaired to the 5D Mark II. I love the Canon 7D’s switch for stills/video! So much easier than jumping through all those menus. Take a look at my article on Customizing the AF. It will be a big help to you. There are plenty of other articles in my Canon 7D Tips section.